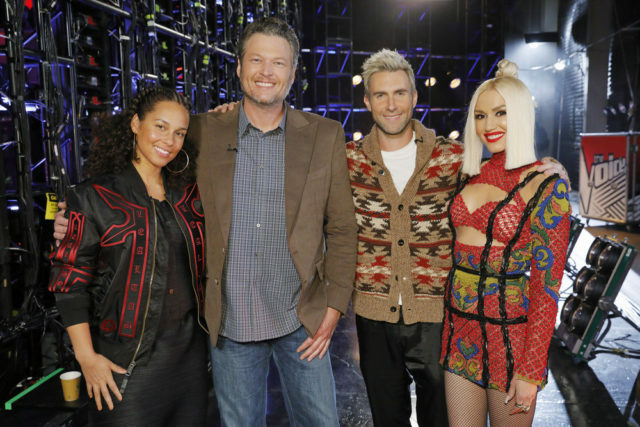 It’s Night Two of The Voice: Season 12! Who shined? Who was stolen? Read on to find out! As Alicia and Blake plotted against Adam, Gwen and her guest advisor Celine Dion had girl time. She paired Johnny Gates and Sammie Zonana and gave them Celine Dion’s cover of “I Drove All Night.” The duo rocked the cover, and Celine stated that she needed to add their version into her Las Vegas show, even Gwen called them “a band.” Johnny’s vocals blew me away from the first few notes, and it was one of the best male rock performances that I have seen in the past four seasons. Sammie also reminded me a lot of a young Norah Jones if she chose alternative rock. As Gwen gave them a standing ovation, both Adam and Blake could not choose between the both of them. While Alicia stated that she would give the edge to Johnny, Gwen wanted Johnny to represent her team in the Knockout Rounds. Team Alicia paired Chris Blue, and RJ Collins together were excited to see DJ Khaled sitting alongside Alicia Keys. She paired them together because both men are two of some of the show’s best soul singers, but have different ways of bringing out their soul music. She gave them Miguel’s “Adorn, ” and DJ Khaled wanted their two distinct voices to mesh together and advise them before their final rehearsal with the duo. At their last rehearsal, Alicia correctly predicted that they would push each other and DJ Khaled stated that the battle reminded him of early 90s R&B. In my humble opinion, Chris Blue delivered a spectacular vocal performance and proved that he was able to sing a more contemporary tune. RJ also surprised me with his stage presence and an impeccable falsetto. As Alicia clapped with pure delight, Gwen loved that Chris got absorbed in the music and was mesmerized by his body. Blake made a bold prediction and stated that Chris could be in the finale. I have to agree with the five-time show champion with this prediction because Chris could be a frontrunner for the Season 12 crown. The final battle of the evening belonged to the youngest members of Team Blake: Aliyah Moulden and Dawson Coyle. Aliyah smiled exponentially got bigger as she met Luke Bryan. Blake gave his young pop stars with Katrina + The Waves’ “Walking On Sunshine.” Luke stated that Aliyah had “a twinkle in her eye,” while Dawson indicated that he had a powerful rock voice. Blake admitted that he did not want them to go home and advised them to stand out in the crowd and ask them to deliver a standout moment. Dawson reminded me of a younger and cleaner Justin Bieber, who has better dance moves. Meanwhile, Aliyah’s voice made my jaw drop! I am glad that both young artists were able to deliver a strong performance. Alicia and Blake gave them a standing ovation, and Alicia stated that she loved their chemistry, but preferred Dawson. Gwen recommended that Blake held on to Aliyah. I am glad that he listened to his girlfriend on this round, but I knew that Alicia was going to steal Dawson. It was very sneaky, but I think that Dawson will shine with her. Next week, the Battles continue! Who will get stolen?